Pastor Heath Lynn was born in Virginia and was raised on Army bases in Germany and the United States. His family eventually moved to Spanaway, where his dad retired from the Army while stationed at Fort Lewis. Heath originally attended Elk Plain Community Church as a youth in 1988. He graduated from nearby Bethel High School (where he met his wife Hannah) in 1991. 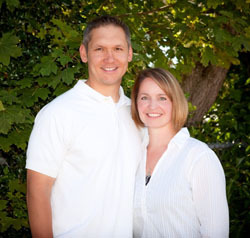 The two attended Eastern Washington University, marrying in 1993 and graduating in 1996. Heath worked as a Software Engineer in the Seattle area for 14 years. During this time he sensed God's call to return to Pierce County and later to pastor Elk Plain Community Church with Village Missions. He is a graduate of Faith Evangelical Seminary in Tacoma. Pastor Heath’s vision for ministry involves energetically making known what God has revealed to us in the Bible, and applying it to daily life. He is passionately committed to evangelism and discipleship, is committed to being transparent and real, and to sharing life with a church of like-minded people. Hannah is known for her tender caring heart. She enjoys ministering to other women, doing minor renovation projects, and being a support person in the church. She teaches Kindergarten and Kindergarten Prep and is the administrator of Elk Plain Christian Preschool. Heath and Hannah have four children: James, Samuel, Sarah, and Jeremiah. The Lynns would appreciate your prayers for their family and work at Elk Plain Community Church. Click here for information about partnering with Village Missions to support the Lynns work at Elk Plain Community Church.